Mental illness can become evident in many different ways. Mental health problems affect a person’s thinking, feeling, or mood. Some mental health problems are severe and disabling; while others are mild. Some may affect someone’s ability to relate to others and function each day. Each person will have different experiences; even people with the same diagnosis. When looking specifically at workplace productivity, there are a few mental health disorders that place an especially heavy burden including; depression, anxiety and substance use. 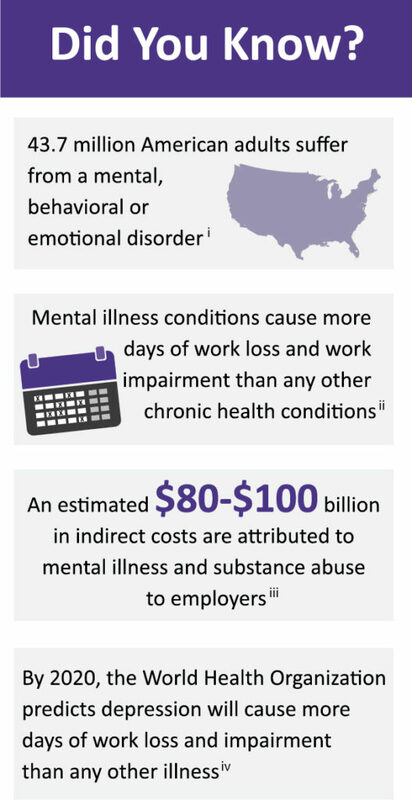 These mental health problems exact an enormous personal and social cost, affecting not only a person’s health, but also his or her ability to work. The good news is that these common mental health problems (depression, anxiety and substance use) are treatable with both medications and with non-drug therapies. Much progress has been made in the last two decades in treating mental illnesses. Treatment type varies by the condition, but most mental health conditions can be effectively treated with one or a combination of the following therapies: medications, group therapy, cognitive-behavior therapy or behavior modification. Early engagement and support markedly improve the outcomes of treatment and enhanced mental health interventions that integrate mental health promotion strategies into the workplace can be a part of the solution [v]. The best evidence for the effectiveness of enhanced mental health interventions in the workplace has come from studies of people with depression. In a 2007 study published in the Journal of the American Medical Association, a group of researchers at Harvard found that “A systematic telephonic outreach and care management program to identify depression and promote effective treatment significantly improved both the symptoms of depression and workplace outcomes. Participants engaged in the program had significantly higher job retention and worked significantly more hours [vi]. Other researchers have also found evidence that work-directed interventions targeting depression enhance the clinical treatment of depression and reduced the number of days on sick leave [vii] and present a cost effective human capital investment for employers [viii]. Unfortunately, there are a number of barriers to effectively addressing mental health problems in the workplace. These include persistent misconceptions of mental illness, the surrounding stigma and discrimination against those with mental health problems. In one vignette study, employers were seven times more likely to recommend hiring an applicant with a physical disability (wheelchair user) than a mental illness (currently taking medication for anxiety and depression [ix] ). Workplace settings where stigmatizing behaviors are not uncommon and employees perceive that their mental health problems will be perceived negatively impact the decision to make use of workplace mental health support resources. Even employees who would directly and substantively benefit from accommodation and support must weigh the workplace culture and their own personal beliefs with their need for enhanced mental health interventions in the workplace [x]. The forum identified four key principles that inform successful workplace efforts to support and foster better mental health [xi]. 1. Know the Impact: Understand the impact that mental illness has on the well-being of organizations and their staff. 2. Break the Silence: Nurture an environment that erases the stigma of mental illness. 3. Deliver Affordable Access: Provide individuals with mental illness access to quality mental health quality care. 4. Build a Culture of Well-Being: Create a workplace that encourages individuals to support their own overall health and mental health. Many employers today recognize that there is there is strong business case for investing in the programs and services necessary to create a mentally healthy workforce. Research has demonstrated that efforts to enhance the treatment of common mental health problems in the workplace reduce employee absenteeism, increase productivity and are a cost benefit to companies. Building on a few key principles, organizations can build the culture of well-being that promotes, supports, and improves the mental health of employees and their families. [vi] JAMA. 2007 Sep 26;298(12):1401-11. [vii] Cochrane Database Syst Rev. 2014 Dec 3;(12):CD006237.